Organizations worldwide are seeking ways to easily, quickly and cost-effectively ensure that their data is appropriately protected. You have a big decision looming over your head – should you renew your existing, legacy backup software maintenance contract, or is time to upgrade to a new platform? 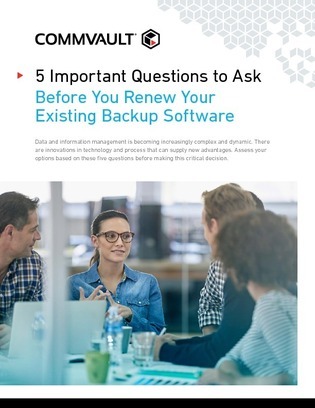 This white paper provides 5 key questions that you need to ask to evaluate your organization’s backup situation before making the critical decision. Read on for the answers that may surprise you.